This appeal was published in the Guardian December 10th 2018. INES and KriWi signed it. 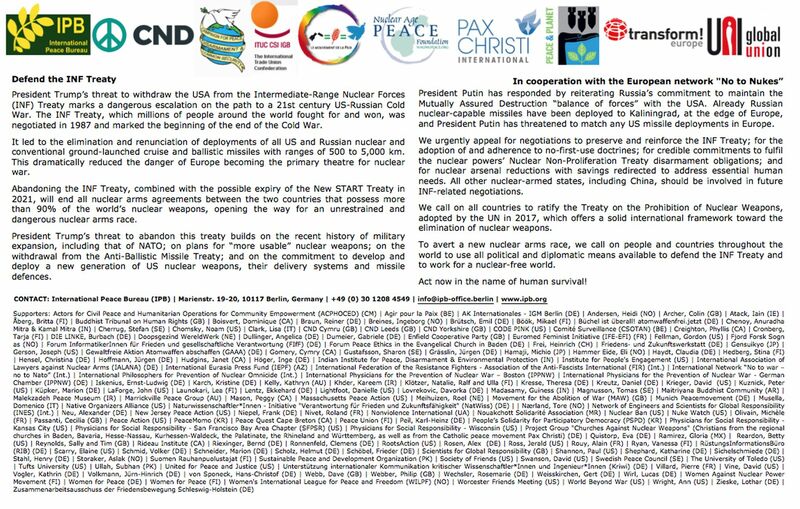 INES (International Network of Engineers and Scientists) congratulates ICAN (International Campaign to Abolish Nuclear Weapons) on winning this year’s Nobel Peace Prize for its successful work to draw attention to the catastrophic humanitarian consequences of any use of nuclear weapons and for its ground-breaking efforts to achieve a treaty-based prohibition of such weapons. This treaty adopted by over 120 countries in the UN was a huge success of ICAN, its partners, one of which is INES, and other members of the peace movement. And the campaign goes on, we have to continue pressuring our governments to sign the treaty. Historical : The courage to ban the bomb! Nuclear War: Hiroshima, Nagasaki, and A Workable Moral Strategy for Achieving and Preserving World Peace.